John Paulson hasn't been accused of any wrongdoing. But the hedge-fund billionaire has gone on the offensive to reassure investors that his huge firm will emerge unscathed from a case that has drawn him into a political and legal vortex. The steps, including a conference call with about 100 investors late Monday, come amid indications from some clients that they might withdraw money from his firm after a lawsuit brought by the government against Goldman Sachs Group Inc. related to an investment created at his firm's request. Investors have indicated they are concerned that scrutiny over the firm's deals may spread, including to overseas regulators. They said they wanted to protect themselves in case new information emerges that could damage the hedge fund, they say. 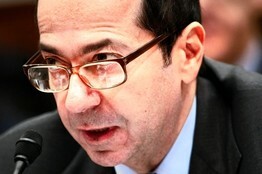 Another issue, they say: The legal case could simply prove a distraction for Mr. Paulson. "Some of the callers asked pointed questions, almost like a court inquisition, but most people were supportive," said Brad Alford, who runs Alpha Capital Management. "I felt reassured that he did nothing wrong." "It's not a rush for the doors," said another investor in Paulson & Co. who has communicated with larger Paulson investors since Friday, when the government unveiled its Goldman case. Mr. Paulson sent a letter to investors Tuesday night saying that in 2007 his firm wasn't seen as an experienced mortgage investor, and that "many of the most sophisticated investors in the world" were "more than willing to bet against us." Mr. Paulson's firm focuses on largely liquid investments, or those that are relatively easy to sell without pushing prices much lower. Even if a number of investors ask out, the firm likely will be able to sell investments without crippling their holdings, investors say. Some traders have been examining Mr. Paulson's top holdings and positions in which filings indicate he has been a substantial holder since the news, they say. When the news of the lawsuit broke on Friday, some of these stocks, including Conseco Inc., Cheniere Energy Inc. and AngloGold Ashanti Ltd., fell sharply. The case has delayed the planned initial public offering of a Canadian investment fund, Propel Multi-Strategy Fund, which was formed to give individual investors exposure to two funds advised by Paulson, according to people familiar with the offering. Propel didn't respond to requests for comment. Goldman's Tourre De-Registered in U.K.
On the Monday night conference call, some investors asked if Mr. Paulson or anyone at the firm had received a government notice of potential civil charges, called a Wells notice, according to people familiar with the call. Mr. Paulson said no. Mr. Paulson said the case wasn't a distraction that was affecting the firm's investments, and that he was confident the public glare would abate. On the conference call, Mr. Paulson calmly explained the trade with Goldman, which involved a "short" bet on mortgage bonds. He said that the very nature of the transaction required both a "long" and "short" investor, suggesting that investors knew that a bearish investor had bet against the deal. Mr. Paulson suggested to clients that the large investors who purchased the Goldman deal and others relied on rating firms, and didn't do enough of their homework, investors say. The hedge-fund firm has a deadline next Friday for investors who want to withdraw money on June 30. Paulson allows most investors to pull out four times a year, but they need to give at least 60 days notice. Investors can cancel redemptions before the end of June. Magnetar Capital LLC, another hedge-fund firm that, like Paulson, was heavily invested in collateralized debt obligations in 2007 also has been working to reassure investors that it believes its mortgage-linked investment strategy was sound and can withstand regulatory scrutiny. Investors in Magnetar, which oversees some $7 billion in assets, also have a deadline next week to request June withdrawals of money. The Evanston, Ill.-based firm sent an 11-page letter to investors Monday saying that it didn't control which individual assets went into CDO deals in which it invested. It isn't clear whether ongoing scrutiny of Magnetar will rattle its investors, who have known some details of the firm's strategy for several years. An article earlier this month in news outlet ProPublica was the latest to assert that Magnetar designed deals built to fail that caused cascading losses for investors on the other side of the trades. The hedge fund's strategy was also the subject of a January 2008 Wall Street Journal article. Magnetar told investors this week that it based its mortgage-CDO strategy on statistical models, not a fundamental belief that the housing market would slide. A Magnetar spokesman said, "Our communications with investors have been very positive and supportive."